The sunny islands of Aruba, Bonaire, and Curacao lie just off the coast of Venezuela with a rich history steeped in both Caribbean and Dutch culture. They are well known as popular winter getaways for scuba divers and beach-loving families from the U.S., yet fewer people know of the fascinating mix of birds that can be enjoyed here at any time of year. 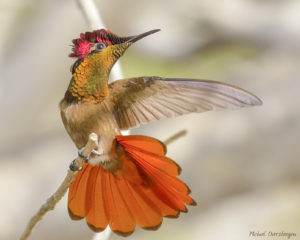 North American birders will be intrigued by South American tropical landbirds like the vibrant green Prikichi (Brown-throated Parakeet), the bright orange “oriole on steroids” Troupial, or the shimmering jewel-like Ruby-topaz Hummingbird (photo by Michiel Oversteegen). Honking flocks of pink American Flamingos on vast salt flats are a memory not forgotten. In migration and winter, the islands are populated with North American waterfowl, shorebirds, swallows, warblers, and other familiar birds. Therein is a connection. “Our birds” spend part of their life in faraway places like the Caribbean. What happens there has equal importance to what happens here. 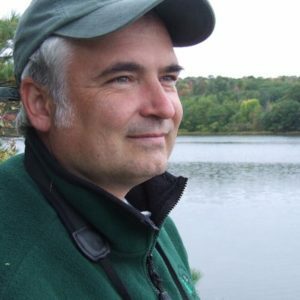 Jeff Wells is an author of several bird books and he is also the Senior Scientist for the Boreal Songbird Initiative and International Boreal Conservation Campaign which are non-profit organizations working internationally for the conservation of North America’s Boreal forest. Come hear about the wonderful birding and eclectic ecology of the ABC islands and why they make an ideal, easy-to-get-to location to combine birding with other family vacation pursuits. The program will be at 7 p.m. in the Mather Auditorium at the Wells Reserve at Laudholm. Come early for refreshments and social time. This program is free and open to the public.